88 is a composite number. 88 = 1 x 88, 2 x 44, 4 x 22, and 8 x 11. Factors of 88: 1, 2, 4, 8, 11, 22, 44, 88. Prime factorization: 88 = 2 x 2 x 2 x 11 which can also be written 88 = 2³ x 11. 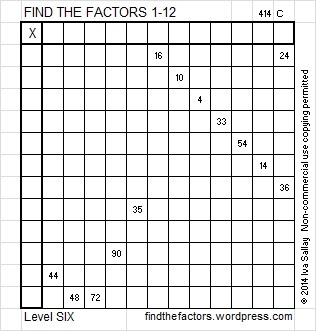 Sometimes 88 is a clue in the FIND THE FACTORS 1 – 12 puzzles. Even though it has other factors, we only use 88 = 8 x 11 in the puzzles. Getting started logically on this puzzle is a little complicated, and I may have abbreviated too much in the chart below, so here is an explanation in regular English: The clue 14 has to use one of the 2s, so the clue 4 cannot be 2 x 2. 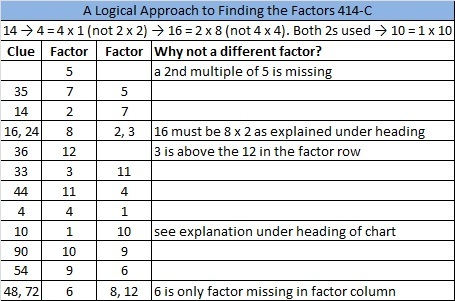 Since 4 will be 4 x 1, and thus using one of the 4s, 16 cannot be 4 x 4, but must be 2 x 8. Since 14 and 16 use both of the 2s, 10 cannot be 2 x 5 and must be 1 x 10. Finally that means that the only clue on the puzzle that has 5 as the factor is 35, so the blank space must belong to 5 as well.